Installation: regardless of your stack, configuration, customizations or integrations, Formtek can insure your install is performed efficiently on your production and test instances. Upgrade: whether upgrading from Alfresco Community or an older version of Alfresco, Formtek can ensure that you are ready for continuing operations as quickly as possible. Configuration: Formtek can configure Alfresco optimally for your environment. Customization: the most popular customizations involve the content model and/or workflow; but our team can meet your unique requirements. 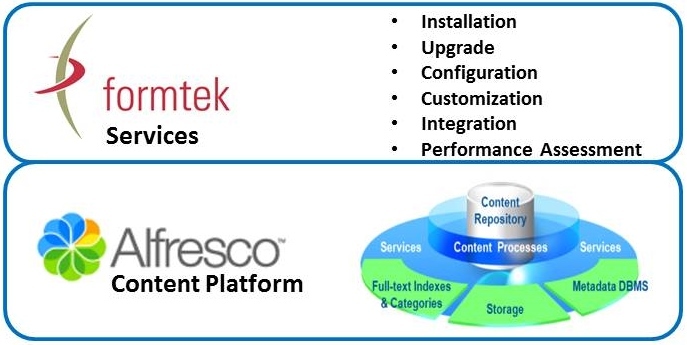 Integration: we can integrate Alfresco with other systems to improve your TCO. Our most popular integration is with Ephesoft for document capture processes. Performance Assessment: if you just want to know if your system is operating at peak efficiency, contact us. We’ve been an Alfresco Gold System Integrator since 2007. We’ve worked with Alfresco 3.2.x through Alfresco 5.1.x. We’ve built our own product extensions for Alfresco. Send information about the checked services.